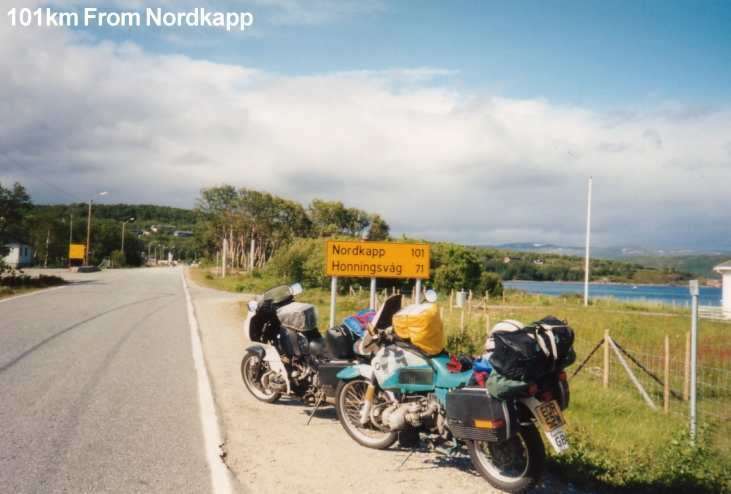 A trip to the North Cape of Norway by bike isn't a new idea, plenty of motorcyclists have done it before and on much worse roads than lead there now. It's one of those mythical trips that only other people undertake. We all know someone who's been there but it's not realistic for us. It's too far, it's too expensive, or we don't have the time! Most of us feel like that about the more 'exotic' holidays but with planning and foresight this type of holiday is possible for many of us. 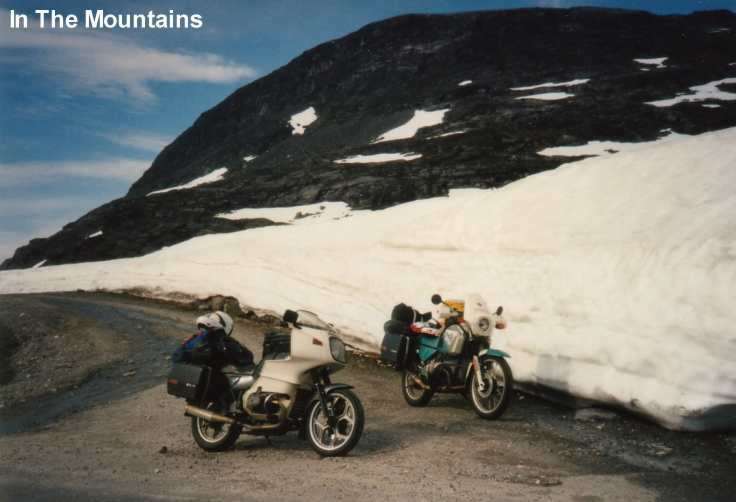 The idea first came to mind whilst on holiday in the Faroes during the summer of '93 when someone mentioned that the FIM Rally was in Northern Norway for '95 - a good excuse to go! By the end of the holiday the decision was made - I'd two years to save and come hell or high water I'd see the North Cape. Being self employed, I don't have too many problems choosing the holiday dates that I want but as summer is my busy period I am restricted to the length of time I can afford, so the first priority was to work out a rough schedule of routes and ferry times. With only three ferries a week to Bergen, I had little choice on sailing dates and in order to gain the maximum possible time for sight seeing after the rally, I decided to allow only two and a half days to get to the rally site near Tromso. With 55 mph speed limits fairly strictly enforced this would mean a lot of hours in the saddle but should be realistic if the weather was good. Saturday, July 1st arrived as the weeks old heat wave left and in cloudy but still dry conditions Tony and I left Leicester to catch the afternoon ferry from Newcastle. During the 23 hour ferry trip the weather stayed dry but as the ferry doors opened, so did the heavens. A 30 minute wait in the pouring rain before the Customs officers appeared and we were cold and wet before even setting a tyre on a Norwegian road. This was to set the trend for most of the holiday, out of the fourteen days we were in Norway, I think eight or nine were wet. It was just bad luck - friends who travelled north two days earlier had sunshine! 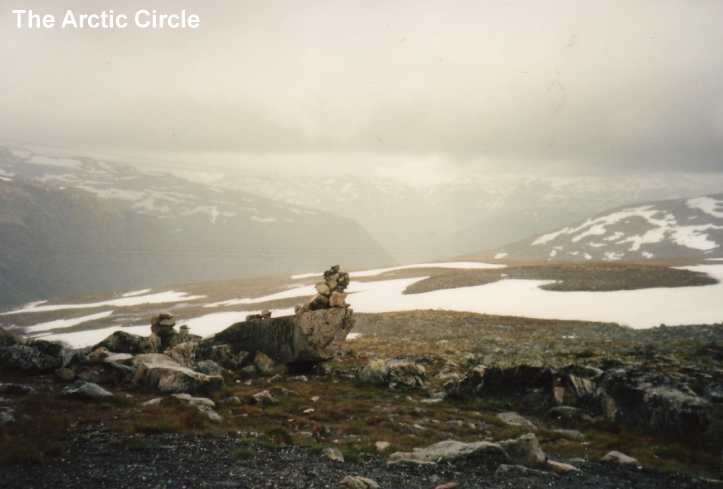 The plan was to stay the first night at a Hostel in the village of Skjolden, some two hundred miles from Bergen but as we climbed the mountains the rain became heavier and colder and we began to wonder if we had overestimated our stamina. Believe me, two hundred miles over the mountains in pouring rain and cold is hard work. Still, the weather has to be better tomorrow doesn't it? Wrong! Tomorrow dawned just as cold and wet and we left the shelter of the Hostel unwillingly around 9am with severe doubts as to our ability to reach the Arctic Circle as intended that day - and we were right to doubt - around 8pm in absolutely torrential rain we succumbed to the lure of a Hostel at Sn†sa around 200 miles short of the intended stop. 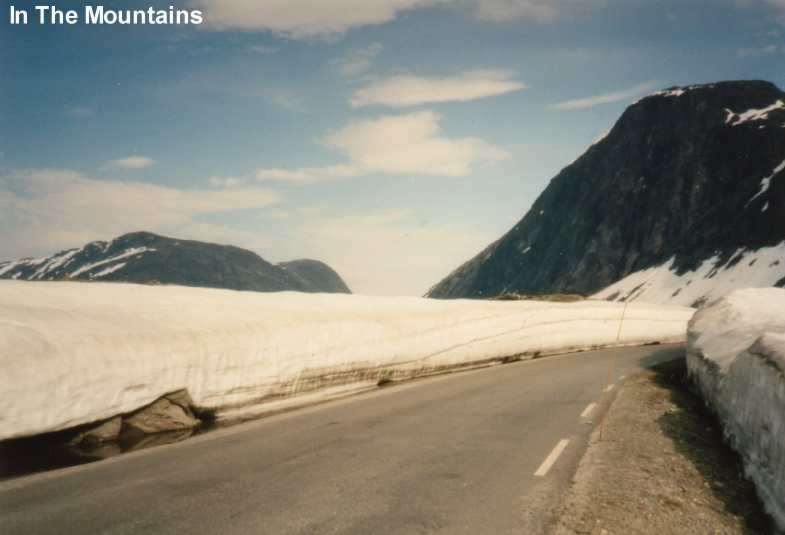 The only memories of that day were cold, rain and a snow storm on the mountains where we scattered a coach load of tourists who were standing in the middle of the road. They were taking photos of the glacier when we appeared out of the snow and they scattered like a flock of sheep. The intention had been to reach the Rally site next day but we were now so far behind schedule that it didn't look as though we would make it until the day after. But if the weather is good tomorrow.... We left the Hostel around 9am - in the dry - by 9.30 it was raining again. A stop for hot drinks and dry gloves at the Arctic Circle Visitors Centre raised the spirits somewhat and late into the afternoon the sun came out. It's amazing how the spirits improve in the sunshine. 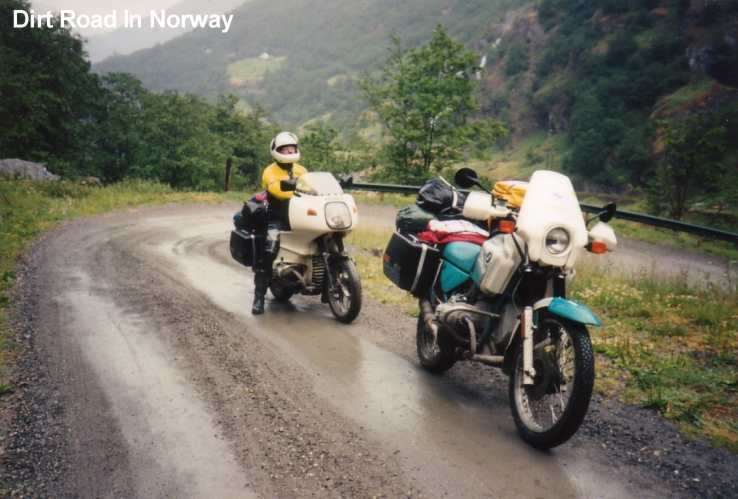 We decided then that we'd aim to reach the Hostel at Narvik which would only leave two or three hours riding to reach the rally site in the morning. We pulled into the Bognes ferry port at 8.02pm just in time to watch the 8.00pm ferry gathering speed away from the dock and discovered that the next ferry wasn't until 9.15pm. If it had still been raining, I think we'd have cried! Back to the drawing board - the 9.15pm ferry meant thatwe'd be unlikely to reach Narvik before 11.30pm - much too late to find accommodation. I think the decision was inevitable, with 24 hours of daylight and the sun actually shining, we decided to head for the rally site at Malselv. 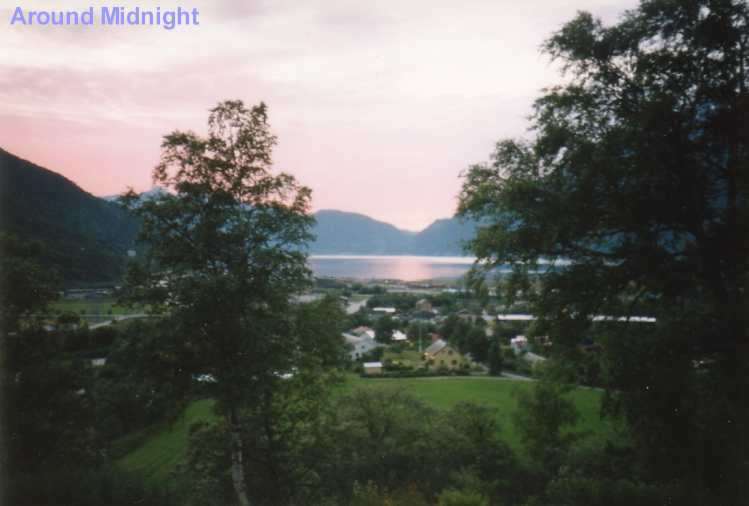 11.30pm saw us stuck at roadworks just north of Narvik, not for too long but long enough to let you think ( can you imagine road repair crews working nights here?). With the long winter nights and the severe cold, they have to do most road maintenance during the summer when they have 24 hours of daylight. About midnight we pulled into a lay-by for a brew up and basked in the midnight sun ( the only night we actually saw it ) whilst drinking coffee and dodging mosquitoes the size of jump jets. The mosquitoes stopped us getting too settled, which was just as well because I really didn't want to get back on the bike - we'd been on the go for 15 hours with the prospect of another couple to go. What we didn't know at this stage was that because of a late snowfall, the FIM organisers had moved the rally about 30 miles south, so it was with some surprise and confusion that we pulled into the well signed rally site at 1.00am. As we began putting up tents, Nigel Huish, bless his cotton socks, came wandering up with two cups of coffee in his hands, always the best greeting on a camp site and especially at one in the morning. By 1.30 Tony had disappeared and we wondered where he was until the gentle snores emanating from his tent told us that he hadn't got lost. Around 3.00am, after sampling the duty frees with Nigel, I had no trouble getting to sleep despite the bright sunshine as the sun climbed higher. Being the first FIM Rally that I'd been to, I wasn't really sure what to expect. Space was so cramped that there wasn't even room to walk between the tents - presumably the original site would have been much better and I certainly wouldn't criticise the Norwegians for this. The sheer logistics of moving a rally site for 2,900 people at fairly short notice must have been horrendous and it obviously created other problems such as bussing all 2,900 people 30 miles to the local airbase (can you imagine the MOD allowing nearly 3,000 foreign motorcyclists to use their facilities?) every evening for meals and the entertainment. 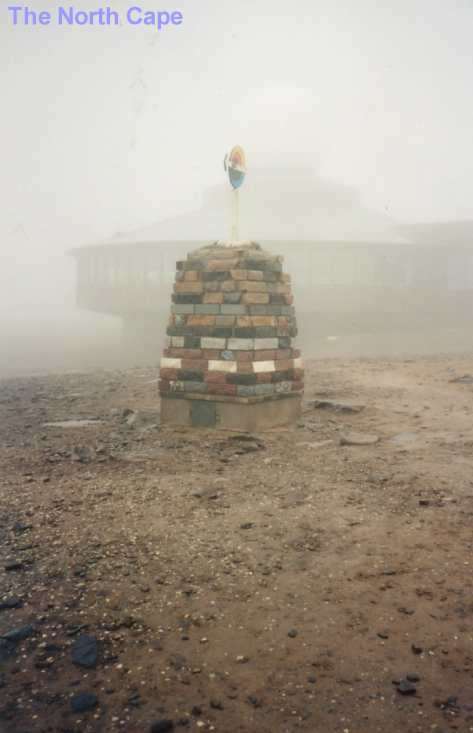 What this did mean for us was that there was no time to do anything other than what was on the agenda - it was always time to be here or to be there ready for something or other, in other words it was too organised. I suppose it is inevitable - to run a rally of that size in any other way just would not work. The evenings entertainers were superb with a variety of artistes including local traditional singers and dancers. The coach tour on the second day was a blessed relief after spending so much time sitting on the bike and the well educated local guide who travelled on our coach was extremely entertaining and told some fascinating stories about the local sites including one about the man who lived in a timber and birch bark hut during the 2nd World war who on being arrested by the Germans asked to use the toilet hut and promptly escaped through the hole! On leaving the rally, we again headed north and shortly came across the first of what was to be many of the Sami tents selling traditional Norwegian trinkets, furs and foods. We ate a bowl of reindeer stew here and washed it down with coffee in which the spoon stood by itself. 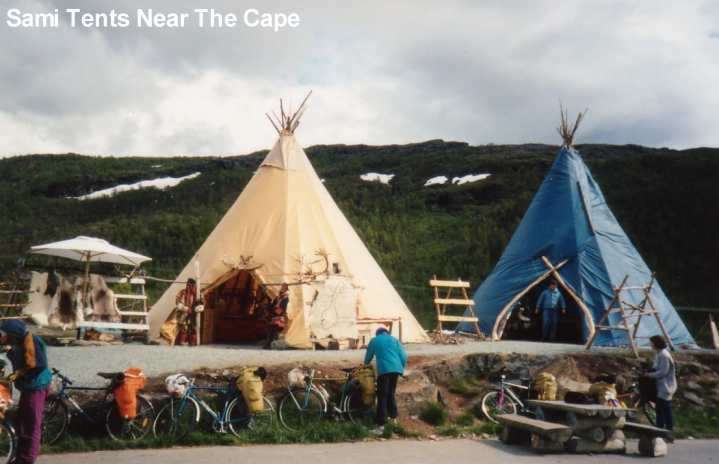 Many lay-bys between here and the Cape had similar tents but the further north you go, the less appetising they become. 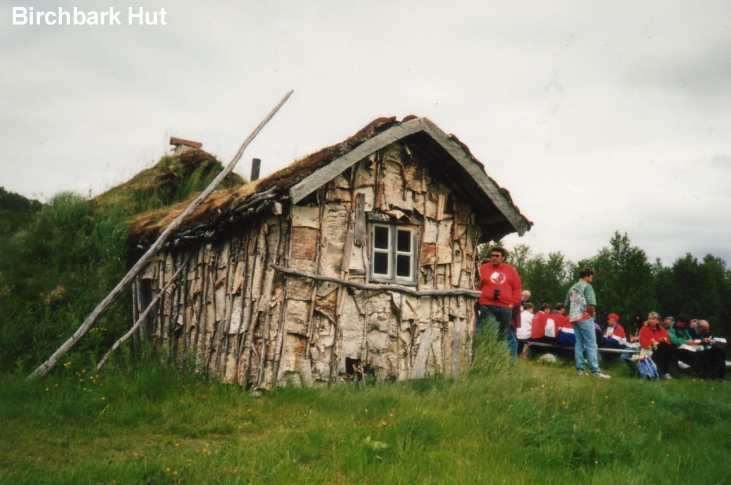 The Sami, the original inhabitants of the area still herd reindeer and are regarded much as we would regard gypsies. 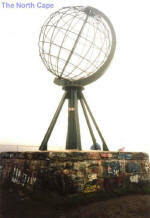 Still heading north in bright sunshine, we began to think that all was set for the traditional midnight photo of the sun shining through the globe at the Cape - we should have known better - the nearer we got the more the weather deteriorated. With fifty miles to go, the rain began and the wind started to rise. By the time our ferry docked in Honningsvarg the temperature had dropped to 3C and the gale force winds were blowing the rain hard. In our wisdom, we decided to stop for the night and see the Cape in the morning on the principle that the weather would improve. Wrong! 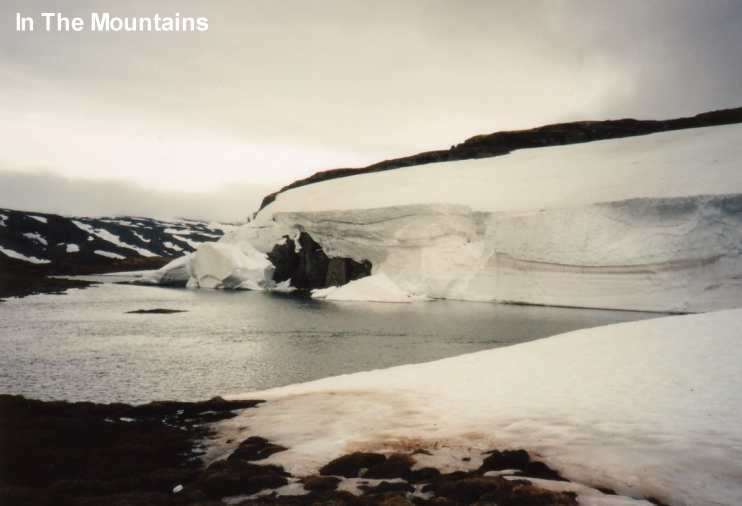 Honningsvarg's Hostel was full and the idea of camping held little appeal in that weather but as we tried to decide what to do, the Hostel manager approached and asked if we'd like him to call a local Guest House to see if they had any vacant rooms. Fortunately they had and it was with relief that we set off for the village of Kamoyv‘r, about twenty miles from the Cape, for what was a very pleasant stay with very friendly hosts and the best fresh cod we'd ever tasted. The hostess explained that it had come from her father in law's fishing boat yesterday. Well worth looking for this Guest House if you're ever there. Morning dawned with the wind still howling and the rain still blowing. By 11am we concluded that things were not going to improve so we headed off for the final twenty miles to the Cape. What a ride, one of the most frightening I can remember in 27 years of riding! Twenty degrees of lean in the wrong direction around most bends and each time we came from the lee of a mountain the wind would hit from a different direction. To make matters worse, within ten miles the cloud dropped and not only could we not point the bikes in the right direction but we couldn't see in which direction they needed pointing! At last we reached the Cape and paid our 115 Kroner each (about £11.50) for entrance and headed for the Visitor Centre and a warming drink. It had taken us over an hour to travel the final twenty miles. After watching the 3D picture show (absolutely incredible) and writing all our postcards, I struggled outside to take the obligatory photo's of the globe. I took three photo's of everything to be sure some were OK as I was struggling to stand upright in the Force 9-10 gale. 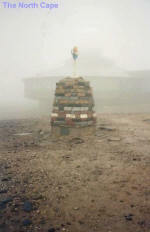 It was with some trepidation that we left the shelter of the Centre and finally headed south. The next hundred or so miles were horrendous with the wind hitting us from any direction at will, the only saving grace was that, unlike the idiots on the roads here, cars drivers were patient and gave us plenty of room. I've never particularly liked mountain tunnels but at this point I'd have been happy to travel all the way to Bergen inside one, as they gave such blessed relief. We had hoped to visit the Lofoten Islands, supposedly one of the more beautiful areas in Norway but time was now beginning to run short so it was with a sense of loss that we made the decision to continue south and the next day saw us riding across the windswept moor land towards the Arctic Circle, with the beautiful but bleak scenery continuing for mile after mile - we'd seen none of this on the outward trip because of the weather. What I assume was the remains of the old E6 followed, roughly, the route we were following - it looked a frighteningly small dirt road and anyone who rode hundreds of miles on that to the Cape years ago deserves a medal - it certainly put our trip into perspective! The Arctic Circle Visitors Centre is modern and clean with the sort of prices you would expect as was the North Cape Centre but having travelled that far you still have to buy stickers etc. to prove it. 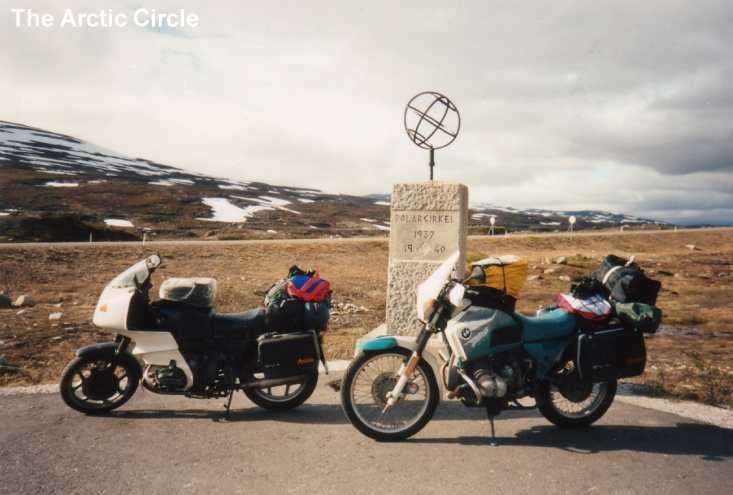 We relaxed in the now warm sunshine and took the statutory photo's, even pushing the bikes beyond the barrier in order to photograph them by the Arctic Circle Globe. As we left Trondheim behind the sun came out and we left the E6 for the last time and turned off to spend the last couple of days touring the fjord area in scorching weather on the way back to Bergen. What a contrast to some of the areas we had travelled through! 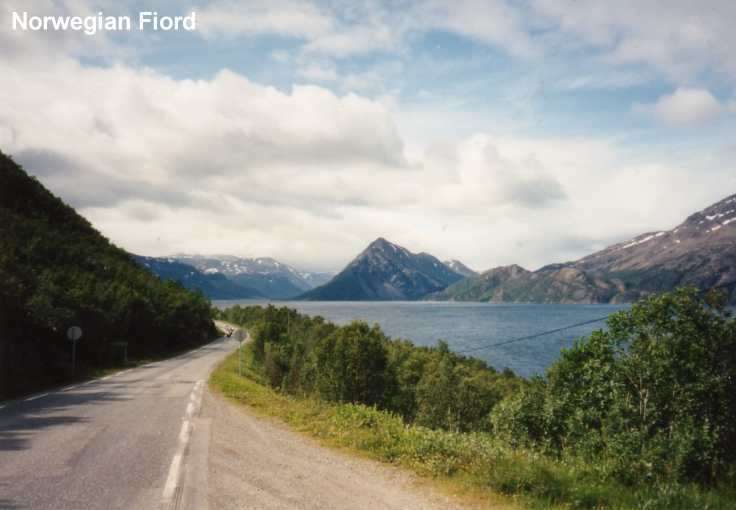 The scenery is unbelievable with fjords and mountains wherever you turn and some of the loveliest windy roads imaginable - hairpins by the dozen and thousands of the, by now, dreaded camper vans crawling up the mountains at 20 mph. A week spent touring this area wouldn't be enough and the two days we took were just enough to give us a taste. Our last night was spent at Mjollfjell Hostel, as the name implies, it's on the fells, in the middle of nowhere around 80 miles from Bergen and it's a popular place for walkers all year round. The Hostel keeper told us that the British Army take over the Hostel for a month during the winter for ski training - in the winter, they would be welcome to it. I chose the route to the Hostel, so it was all my fault. Well, my map showed a subsidiary road from both north and south and it seemed logical to go in from the north and out to the south in the morning. I should know better! Following the map carefully, we found the subsidiary road and to my delight it was a dirt road, the first one we'd found. To my mind, this was one of the best rides of the holiday, Tony, with his RS wasn't impressed but we stuck at it and about 15 miles later came to the inevitable sign saying "No Cars Or Motorcycles" at a point where the road was downgraded to a zigzag path going nearly vertically up the side of a mountain. I swear we must have been within two miles of the Hostel. We had no choice but to reverse our course, ride about 50 miles around the main road and come in from the other direction which entailed a 20 mile ride on a tarmac road that was in far worse condition than the dirt road we'd just left. So much for an early day! 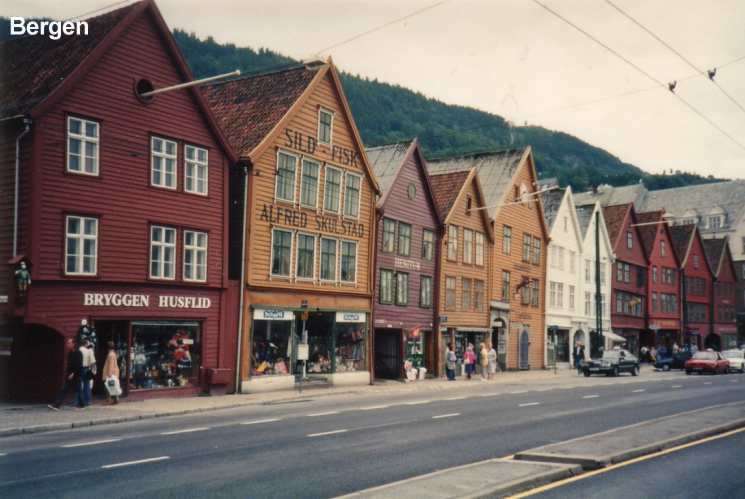 The ride to Bergen next day was uneventful but entailed using the longest tunnel in Norway, 13.4 kilometres. Believe me, it goes on for ever. Arrival at the quayside saw us greeting other Club members who we hadn't seen since the FIM including one with his bike in the back of a van having been unlucky enough to have had two accidents. Would I go again? Definitely. Unless I had plenty of time, I don't think I'd go to the Cape a second time but only because it put time constraints on what else we could see. 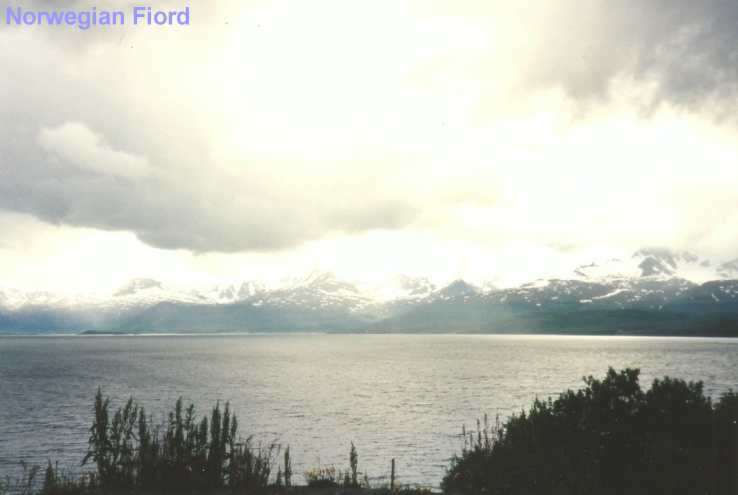 I'd still like to see the Lofoten Islands and certainly I will go back sometime to tour the Fjord area properly. It may be a while though as an American I met at the FIM has offered me the use of a BMW in Florida next year and as the BMWMOA National Rally is in North Carolina, I hope to ride the Blue Ridge Parkway next year.